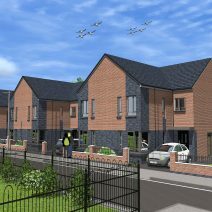 This site has 6, two bed units being built for shared ownership. All units benefit from off road parking as well as visitor parking. This scheme has a fantastic location and was the former Bowland Road Neighbourhood Office. STG are contractor with a completion expected summer 2018.